The Ancheer B-3008 is an indoor cycling bike made for home use. In terms of features, it can be compared to the PYHIGH S2 cycle but has a considerably heavier flywheel. It’s definitely not a commercial exercise bike, but offers pretty decent durability and comfort, and can support most spin workouts. The Ancheer B-3008 features a durable frame made of steel tubing. It combines ovalized with rectangular bars and features precision-welded joint points. Therefore, it offers excellent sturdiness. It also has a short step-up bar that connects the seat tube to the main tube of the frame. This particular feature can be quite a plus for certain spin workouts and not every spin bike has it. The bike’s frame is coated with a thick, rust-resistant paint finish. The only exceptions are the seat post, the handlebar post, and the flywheel which feature a chrome plating. The main color used for the main frame of this particular model is yellow, but there is also a black/blue version and a red/platinum gray version. This Ancheer indoor cycle is not an extremely large fitness machine. When fully set-up, it takes approx. 43″L x 19″ (109 x 48 cm) of floor space. But nonetheless, it is recommended to leave at least two feet of clearance all around it to be able to execute any spin workout. The bike doesn’t offer the weight of a commercial bike like the Spinner P3, for example. However, it does weigh approx. 90 lbs (41 kg), which is more than twice the weight of a road bike. All this weight adds stability to the unit. So, this being said, it won’t rock or wobble even if you engage in a more demanding workout. One last aspect to mention here regards the two accessories included with this exercise bike. One is the phone holder, the other is the bottle holder. The phone holder is ABS-made and attaches to the top of the handlebar. It’s large enough to accommodate any type of smartphone. The bottle holder is aluminum-made; it attaches to the right side of the bike’s fork. It’s a bit flexible so it should be able to accommodate most hydration bottles. The Ancheer B-3008 features a high-comfort seat. There are quite a few aspects to mention about it. To begin with, the saddle features a highly durable, double-stitched faux leather upholstery. It integrates a thick layer of foam padding which enables it to offer considerably more comfort than the average slim spin bike seat. Its rear section features two springs which improve shock absorption. Also, it has a center, longitudinal cutout which improves breathability during seated exercises. 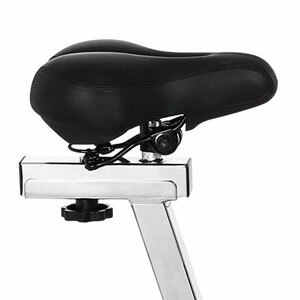 Nonetheless, the saddle has a standard attachment system. Therefore, if by some reason you want to replace it, you should be able to find a compatible saddle in any bike shop. The seat has 4-way adjustability (up, down, forward, and backward). Its upright post offers approx. 7″ (17 cm) of adjustment, from a seat-to-pedal distance of 27.5″ (70 cm) to 36.2″ (92 cm). 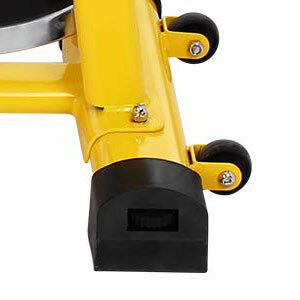 Also, its horizontal slider provides a few extra inches of front-to-back adjustment. This being said, the bike should be able to accommodate users between 4’10” and 6’2″ (147 – 188 cm) with no problem, promoting a healthy leg extension. The handlebar features a multi-grip design, with a small loop aero bar in the center. It is completely covered by a layer of rubber-foam material in order to provide a secure grip. However, it only provides upright adjustability. Its post offers approx. 4″ (10 cm) of adjustment. Both the seat and the handlebar can be adjusted very quickly, in less than a minute. They have large knobs which are easy to grip and turn. 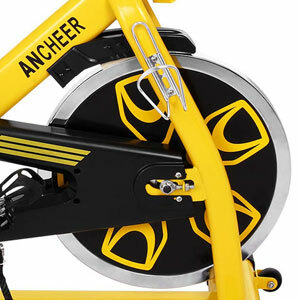 The Ancheer B-3008 indoor cycling trainer features a belt drivetrain. This comes with several advantages. First of all, there is no maintenance hassle; it does not require any lubrication. Second of all, it provides a very smooth pedaling motion, with less vibration than a chain drive. And third of all, the pedaling motion is almost completely silent. Since it’s an exercise bike designed for spin workouts, it is equipped with a highly durable crankset. It has steel crank arms and metallic alloy pedals, designed to support users up to 275 lbs (125 kg) in full standing up pedaling routines. The pedals have adjustable toe cages for extra thrust and foot stability. They also have standard 9/16 threads, so you can easily find replacements for them if you have to. Although it’s a rather small bike compared to other models, it comes with an extra-heavy flywheel. It weighs 49 lbs (22.2 kg) and is perimeter-weighted in order to provide a highly consistent momentum and aggressive inertia. This being said, the bike offers the possibility to perform high-intensity workouts. The flywheel is also bi-directional. Differently put, you can pedal in reverse if you want. Thus, you can put some diversity into your workouts. This Ancheer exercise bike is equipped with a standard friction resistance system. It consists of a felt brake pad attached under the main oblique tube of the bike’s frame and on top of the flywheel. It is connected to the tension dial on top of the oblique frame tube. Therefore, by turning this dial clockwise, the brake pad will apply more friction to the flywheel which leads to a higher pedaling difficulty. There are no distinct tension levels marked on the resistance dial. You simply tighten it until you get the pedal tension that fits your needs. Also, the dial has the function of an emergency brake; it has an internal spring which allows you to quickly press it in order to instantly stop the flywheel from spinning. This may actually be necessary at some points because the pedals continue to spin for as long as the flywheel is spinning. 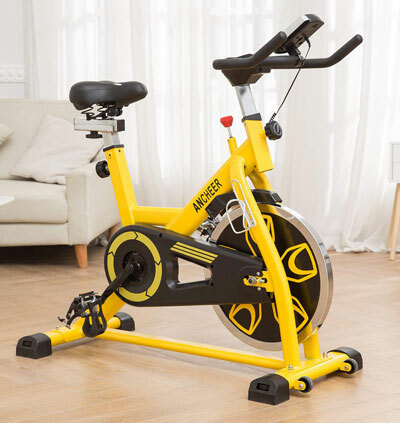 This indoor cycling bike includes a basic fitness meter. It features an LCD display which indicates time, distance, total distance, speed, and calories burned. It does not have a pulse reading function and the bike does not have any pulse sensors. Therefore, if you want to keep track of your pulse rate, or perform HR-based workouts, you will have to use a separate device. Also, the distance and speed are shown only in miles/mph; there is no option for metric units. 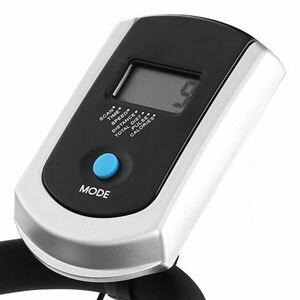 The exercise meter unit is very easy to use. It’s battery powered and only has one button which covers all of its functions. By pressing the button repeatedly you can select any of the workout metrics to view on the display, or you can select the Scan Mode which rotates all the metrics, showing each one for a few seconds. By pressing and holding the button, you can reset all the metrics to zero. The meter unit starts up when you begin pedaling or when you push its button. It also has a sleep mode to which will enter after a few minutes of inactivity on the bike. Most of the bike comes pre-assembled. The flywheel, the brake system, the crankset, and the belt are already attached to the main frame. You only have to attach the base bars, the seat, the handlebars, the pedals, and the exercise meter. This shouldn’t take more than 30 minutes. A basic toolkit for assembly is included, while the manual provides step-by-step assembly instructions. For maintenance, the bike’s brake pad may require lubrication if it squeaks when in contact with the flywheel. A few drops of silicone lubricant should solve this issue. Other than this, it’s recommended to periodically inspect the bike for loose bolts or parts, and re-tighten/replace them if necessary. The Ancheer B-3008 is an indoor cycling bike for home use. It features a 49 lbs flywheel, a friction resistance system, a belt drivetrain, and a high-comfort seat. It’s also equipped with a fitness meter which tracks time, distance, total distance, speed, and calories. It’s a bike designed for spin workouts, great for light to intense cardio training, interval training, weight loss, leg muscle strength development, and stamina improvement. 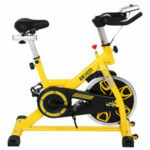 It’s also an affordable trainer, an excellent alternative to a commercial grade spin bike.